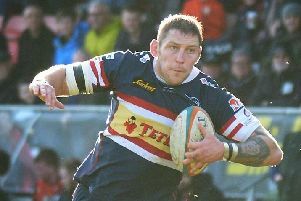 Irish half-back Michael Heaney is proving to be one of Doncaster Knights’ best summer signings. “It's going well and I'm getting quite a bit of game-time, which I wasn't at Ulster last season, and that's why I decided to come here,” said the scrum-half. “I’d not thought much about playing in England until the situation arose back home. “I spoke to Clive (Griffiths) and he sold the club to me pretty well and, as I say, it’s turned out well. “We certainly can’t complain at being second in the table. It might be a surprise to some people but we’ve worked very hard and feel that we are there on merit. “The club finished the season well last season and they kept the majority of the players and added to it and brought in guys who were certainly going to add to the team. “I’d like to think that Declan (Cusack) and myself have played our part and I think we’ve formed a bit of a partnership at half-back after getting over our respective injuries. “I knew of Declan before coming here but I’d never played alongside him back home." Cusack’s injury, in only the second game, allied to Simon Humberstone being sidelined for several months after being injured on the eve of the season, resulted in Heaney having to take on the fly-half role prior to picking up a leg injury at Headingley and missing several games. Looking ahead to the rest of the campaign, Heaney said: “I don’t see why we can’t continue to challenge for top spot. We picked up a five-point win down at Bristol last month and we also recorded a good win at Bedford on Saturday. Knights take a break from the demands of the Championship for the next two weekends as they resume their B&I Cup campaign. “The league is our priority but we want to win every game we play whatever the competition,” said Heaney.